Today’s volatile and complex financial markets can make even the most educated and patient investors question their strategic direction. Combined with the uncertainty left in the wake of the Banking Royal Commission, now is the time to consider what you should do next. Research shows that investors highly value a Second Opinion to confirm they are on track. Alman Partners True Wealth provides sound and clear financial advice in line with our core value of putting our clients first. We are offering this to our clients, their friends, family and associates at no charge* whatsoever. *Alman Partners’ usual fee for this type of review, depending on the complexity, is typically between $300 and $1,500. complimentary, no obligation Second Opinion! Alman Partners True Wealth will examine your current position and future expectations and offer a realistic appraisal of your existing investments and superannuation, to do with as you please. As part of our complimentary Second Opinion Service, we review and rate your current strategy. Next Steps… This part is completely up to you. You have no obligation to act on our findings. We are simply providing you with part of the service that we offer all of our clients. We are certain that you will realise that you have found investment professionals with extensive knowledge and experience. Dave and his wife Cheryl* had expressed some concern with their investment affairs. They had an eclectic mix of investments with little apparent overall strategy and were unsure whether their investments were right for their situation. 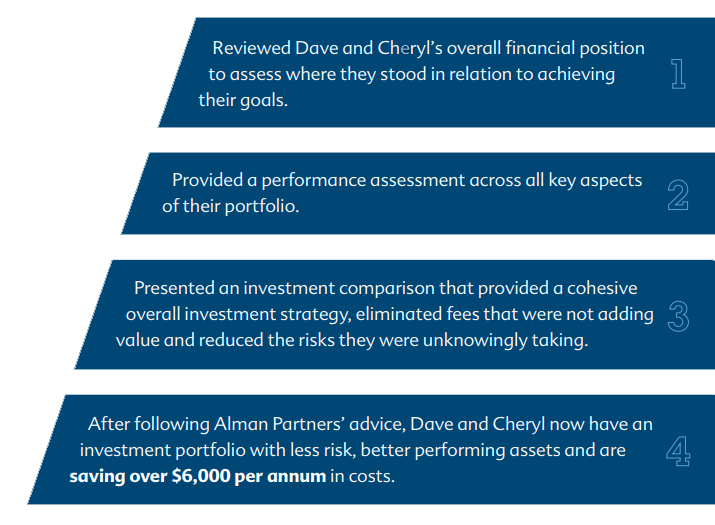 Dave and Cheryl took advantage of a FREE Second Opinion Service that was offered by Alman Partners True Wealth. *Names have been changed to safeguard our clients’ privacy.